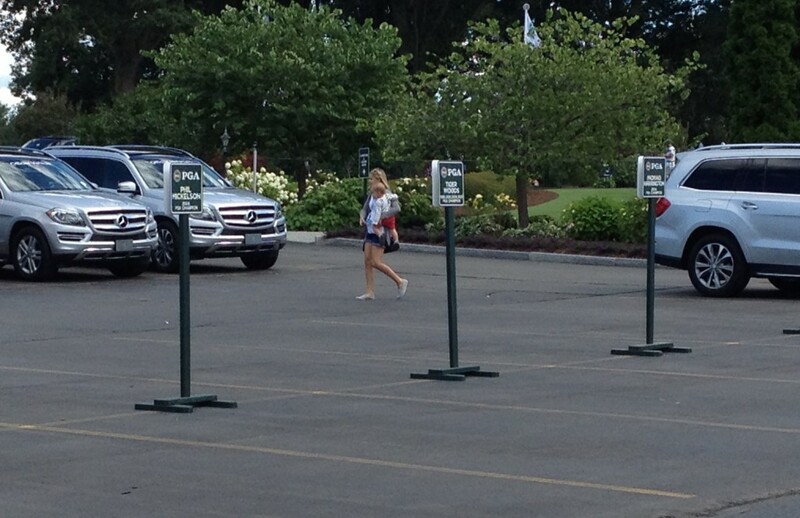 We’ll always have a place for Tiger Woods in the players’ lot–and everywhere else, as I noted when I snapped this shot at the 2013 PGA Championship. Apologies to golf purists who claim they don’t want to hear about Tiger Woods unless he’s on the leaderboard. I sort of understand your point. I dabbled with being in that camp years ago. But then I realized that Tiger transcends. By winning 14 majors by the age of 32 and just generally dominating the golf landscape in every way possible, he made himself an athlete for the ages. He wasn’t merely in the same league with Jack and Arnie; he was right there with Michael Jordan and Wayne Gretzky, Babe Ruth and Mickey Mantle. And in his fall from grace, maybe even Elvis and Marilyn Monroe. By going seven years without a major win since the 2008 U.S. Open while battling myriad injuries and a shocking tale of serial marital infidelity, Woods has added layers of fallen-idol celebrity. You don’t have to be a gossip hound to be relentlessly curious about Tiger Woods’ next step or misstep. And this week, there’s a lot to ponder. Woods has announced he’ll play in six tournaments before the PGA Championship, starting with this week’s Players Championship. So, it was either Lindsey Vonn or the Greenbrier Classic? We’ll leave that breakup for the Television Tattlers to sort out. Between that and the ninth anniversary of his father’s death, Woods said Tuesday, he hasn’t been able to sleep. The good news is, Lindsey and Tiger never got married or had children. If you thought they were going to live happily ever after, you don’t need to go to Fantasyland. The question at this point is, what can we expect from Tiger at the Players Championship this week? My first thought is, don’t expect much. Then again, I expected very little from Woods at the Masters and he played much better than expectations, finishing 5-under, tied for 17th behind Jordan Spieth’s marvelous 18-under victory. In his only other appearance where he finished 18 holes this year, Woods had all kinds of problems, notably with chipping, while missing the cut at the Phoenix Open after a second-round 82. And while he seems to have the injuries that have dogged him under control, whether he can keep his tee shots in play and be sharp with his approaches at the challenging TPC Sawgrass are large questions. And so, my second thought is the same as the first: Don’t expect too much. Another performance like the Masters, where he makes the cut and shows some flashes here and there while finishing in the top 20 would be positive, from where I sit. Tiger won’t be satisfied with that, and he shouldn’t be. His 79 PGA Tour wins, second only to long-playing Sam Snead (82), is a remarkable accomplishment. But these days, Woods is all about winning majors. You can practically hear him grinding his teeth especially hard at majors, and that’s a big hurdle in itself. An elite event like the Players remains more of an indicator for a legend like Woods. But it’s an awfully good indicator. After he defeated Rocco Mediate in that playoff at Torrey Pines for the 2008 U.S. Open championship, it would have sounded conservative to say he would add five more major championships by this point. That would have given him 19 majors, one more than Jack Nicklaus, for the all-time record. Nicklaus, by the way, won six majors from age 32 to 39. That didn’t happen. With every missed opportunity, it seems less likely that Woods will rise again. But that won’t stop us from watching and wondering if we’ll ever see another magic moment from a legend. 6—Tournaments Tiger Woods plans to play in before the PGA Championship. . . The Players, the Memorial, the U.S. Open, Greenbrier, the British Open and the Quicken Loans National. 49—Golfers among the top 50 in the Official World Golf Ranking in the field at the Players, which generally has the strongest field in golf. THREE TO WATCH. . . at the Players Championship, TPC Sawgrass, Ponte Vedra Beach, Fla.
1—Jordan Spieth. Tight Sawgrass course suits his game. And after failing to advance despite a ton of birdies at last week’s match-play event, he’ll be rested and hungry. 2—Justin Rose. Low-keyed and relatively under the radar, he’s all-around solid and playing really well lately. 3—Brooks Koepka. This Tallahassee native, who turned 25 on Sunday, is talented and healthy again after winning at Phoenix on Feb. 1. 12th annual Heart Haven Outreach golf outing and dinner, July 15, Bolingbrook Golf Club. Benefit for HeartHavenOutreach, which provides educational and developmental programs for at-risk teens. Details to be announced at hearthavenoutreach.org. Setback aside, don’t sleep on Indiana. That said, IU needs to look alive. More Ryder Cup peril for USA?